Rediker Software is committed to integration, interoperability, and partnerships with the best education companies. Our own School Office Suite® is a group of best-of-breed software solutions for other parts of your school that is seamlessly integrated with AdminPlus. Our SIF agent allows our database system to exchange data in real time with other SIF-enabled applications and with states using SIF for data reporting. Our partnership with Microsoft Azure provides a secure, scalable solution for product development and deployment. The Administrator’s Plus SIF Agent is certified as a SIF 2 Enabled Application. The Administrator’s Plus SIF Agent provides real-time data exchange with other SIF-enabled applications, eliminating double data entry. It also streamlines “horizontal” data exchange, between schools within a district, and from districts to state education offices that use SIF for state reporting. Timely and accurate data benefits the students by allowing staff and parents to be more involved and engaged in their education. Rediker Software has been committed to the SIF framework since its introduction. John Lynch, our Director of Program Operations, previously served for several years on the SIF Association NA Technical Board. John is an active participant in developing the SIF 3 specification. Rediker Software has a team dedicated specifically to SIF and your state reporting needs. Our staff stays up to date on the latest SIF and State Reporting requirements. Learn more about our latest Massachusetts SIF Vendor Contract. Rediker Software offers an integrated school information system that provides a unified software solution for record keeping throughout the school. Because the Suite is fully integrated, when student information is entered into or updated in our Student Information System, that information is automatically distributed to all School Office Suite® system programs used in your school. Eliminate the frustration of disconnected departmental software programs and let our integrated School Office Suite create one flexible, unified system to manage your entire school's record keeping. Is your school looking for powerful, yet easy to use school fundraising and donor management software? Rediker Software offers Sustain development software as part of our School Office Intergrations. Utilizing the latest in web-based technology, Atriuum offers school districts and public libraries an easy-to-use, affordable library automation solution. In addition to supporting traditional library functionalities, Atriuum also supports a variety of electronic resources, social networks, and RSS feeds. QuikLunch Cafeteria Software is equipped with the tools to move your serving line quickly and efficiently. Like mixing different products? Rediker Software offers many integration opportunities with these leading education providers. Don't see your product here? Talk to us about integration options. FACTS Management Company, Smart Tuition Services and Tuition Management Systems (TMS) are the nation's leading tuition management providers for K-12 schools. We work directly with these companies to offer schools a simple solution to collecting tuition payments efficiently. Administrator's Plus comes with a built-in export utility which helps schools prepare student, staff and class data for Apple School Manager. 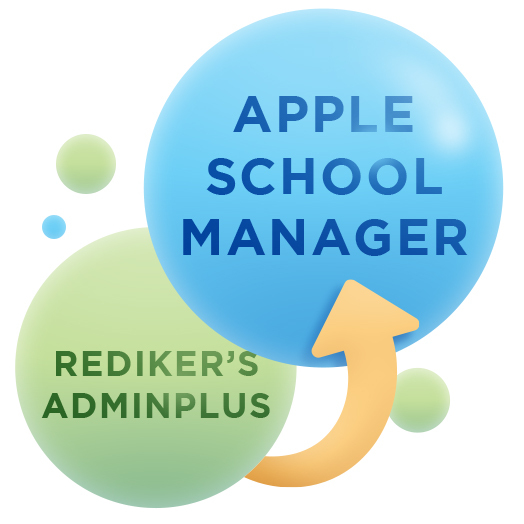 Rediker Software's Administrator's Plus integration with Finalsite allows you to connect the best student information system with one of the leading website providers. As a result, data flows seamlessly between both solutions, ensuring data is never entered twice. SNAP Health Center™ by PSNI is an all-inclusive Electronic Health Records (EHR) solution designed specifically for the school health clinic. The program provides a complete clinical picture for each student and streamlines clinical documentation. Connect AdminPlus and TeacherPlus Gradebook with Frontline IEP by Frontline Education. Frontline IEP is a leading web-based Special Education software program with state-specific Individualized Educational Program (IEP) solutions. Our interface with Frontline IEP provides a seamless sharing of demographic data between AdminPlus and Frontline IEP. Furthermore, teachers can view IEPs from Frontline IEP while in TeacherPlus Gradebook. Clever is a simple way for schools to keep their learning software automatically in sync with the rosters in Administrator's Plus. When a school signs up for Clever, they can securely sync enrollment data from Administrator's Plus with all the applications they use. Schools can set up a single roster sync, and this integration can be done automatically. School administrators maintain complete control over what data is shared with each application partner. Clever can save schools - especially teachers and support staff - hundreds of hours of data entry that wastes instructional time. OneNote Class Notebooks have a personal workspace for every student, a content library for handouts and a collaboration space for lessons and creative activities. Teachers can use OneNote Class Notebook with Rediker's Administrator’s Plus SIS for assignment and grade integration. Microsoft's School Data Sync (SDS) is a free service in Office 365 that helps automate the process of importing school data. Share class roster data out to your school's various Office 365 apps via School Data Sync. AdminPlus automatically generates a CVS file that can be easily uploaded to the SDS service. Microsoft Azure enables companies to connect web and mobile applications to an existing IT environment. Through Microsoft Azure, Rediker Software is able to create a seamless connection between its student information system, Administrator’s Plus, and the company’s web and mobile applications for parents, students and teachers. As a result, members of a school community using Rediker Software’s products can easily access up-to-date data such as student demographics, grades, attendance, schedules and discipline from the web or directly from a mobile device. Microsoft Azure provides Rediker and its school communities with a cloud platform that is secure, scalable and cost-effective. Whether in the U.S. or abroad, parents, teachers and students receive a positive user experience with fast, reliable access to the information they need, anywhere – anytime. Global Datacenters – With more than 100 datacenters worldwide, Microsoft has built one of the most-connected commercial cloud networks in the world. Security – See how the different features and investments make Microsoft's datacenters the most secure in the world.